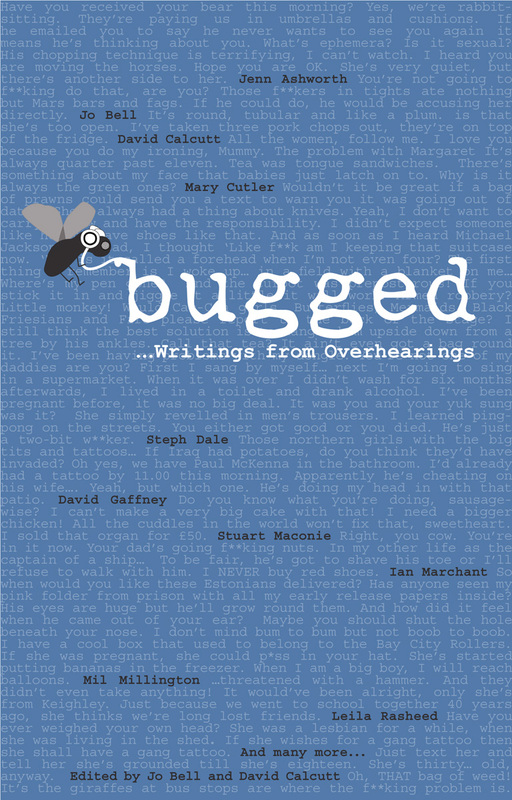 Bugged | Creative eavesdropping – now in print! Welcome to Bugged. Our first nationwide writing experiment was a huge success, bringing together writers all over the UK in a real and virtual community and a bloody nice book. Read on to find out what we did…. 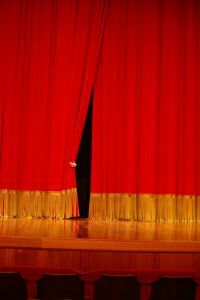 and a hint of our Brand New Bugged for 2012! We featured in the Guardian and the Times: we opened Manchester Literature Festival and closed Birmingham Book Festival. The festivals, putting their money where their mouth is, gave us £250 each – otherwise we were entirely self-funded. It was strangely liberating. 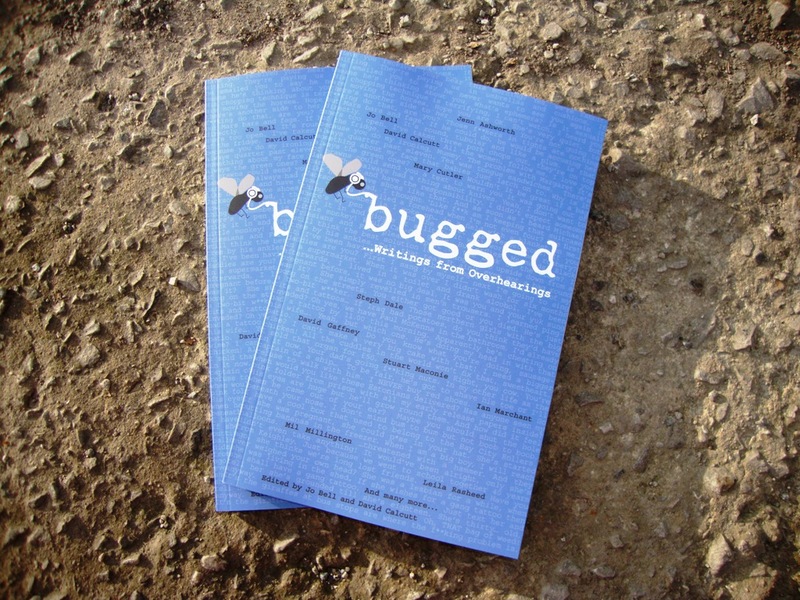 Bugged writers appeared on Radio 4, in the national press, at festivals and in print all over the UK. Calum Kerr, who had seldom been in print before, has gone from strength to strength and his short stories will be broadcast on Radio 4 on Christmas Eve! This blog has had tens of thousands of hits – earning WOW status from WordPress, and creating exposure for featured writers. So Bugged was a happening – a challenge – a community – and it was fun. It was friendly and conspiratorial. Some of you came back to writing after many ‘dry’ years and we’re delighted to have moistened you. Some of you wrote for the very first time. Our community of writers was partly physical – writers who live in the same region met up – and partly virtual. Although we live all over the UK, we’ve chatted on Facebook and on Twitter @buggedproject. 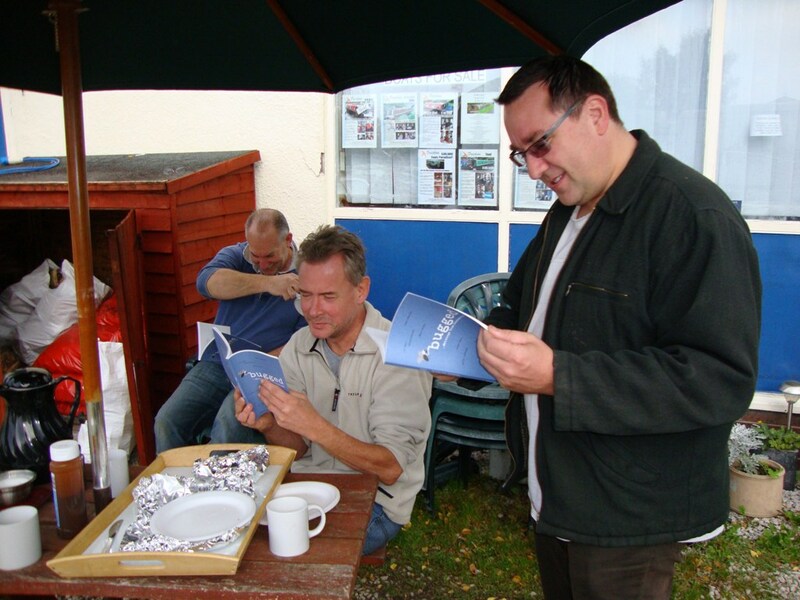 We met at our many Bugged launches and readings, and connected writers to links, funding opportunities, new blogs. Even those pieces that didn’t make it into the book were put to good use. Some of you have sent them to journals, magazines or editors with great success. Angela Topping is using one of hers in writing workshops, and has published another as a teaching resource. 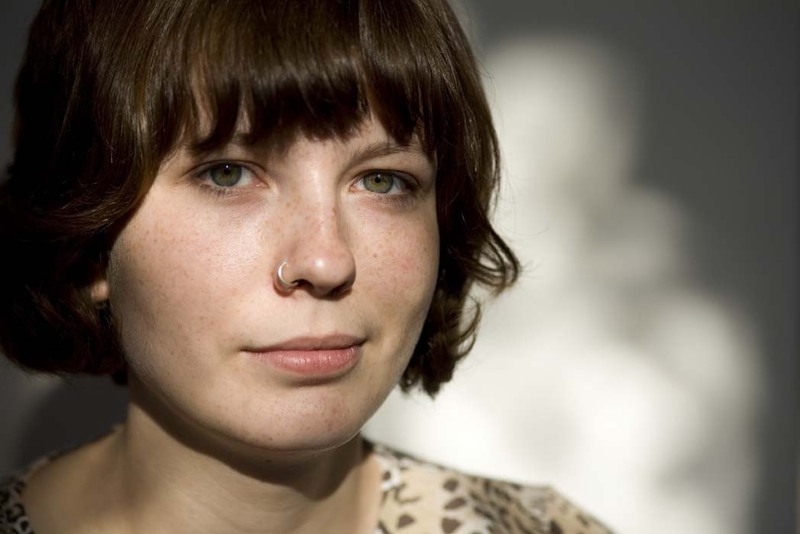 Max Wallis has had his published on Authortrek; Liz Loxley’s appeared on the Daily Mirror blog after being selected by Carol Ann Duffy. What next? Ladies and gentlemen……. Son of Bugged! We aren’t going to tell you what it is yet but we can tell you this. It will NOT be exactly the same theme. There WILL be a mass happening in May 2012: there will be the same six-week deadline to get your writing in to us. There will be a book, including commissioned professional writers and the best public submissions. There will also be parallel events – workshops, events and showcase readings to encourage new work and to give all the writers maximum exposure. If you run a creative writing course, a spoken word event, a festival that happens any time between May and October, a writing group, a venue where writers meet…. get in touch with jo@bugged.org.uk to let us know that you’re interested. We’ll be announcing full details in the new year and we want you to be the first to know. Follow this blog, or find us on Facebook and/or Twitter to keep up to date. Last year we had hundreds of entries – this time we want to at least double that interest and get the most exposure possible for all our writers. 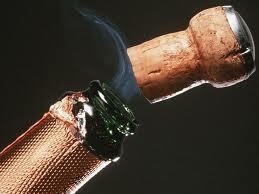 Have a happy holiday – and keep your eyes peeled for more news…..
Popping our cork. As it were. Wales, west from Derby… they were Jenn Ashworth (right, with McTiny), Cathy Bryant, Dorothy Burgess, Emma Morgan, Susannah Hart, Emma Lannie, Liz Loxley, Ian Marchant, Lynsey May, Angi Holden, Alicia Ogg, Calum Kerr, Valerie O’Riordan and Phil Williams. Every one observed our dire warning to stick to a 3-minute reading – although for the prose writers this sometimes meant cutting their work in half. We made’em laugh, we made’em cry, and most importantly we made’em buy books. Want a copy of the book? Here’s how. The best way is to buy it direct at the Birmingham launch. No postage! Or… order direct from us to get the special edition version (chunkier, nicer, quicker – and the same price) until we run out. If you submitted work to Bugged – whether you are in the book or not – the price is £4.99, plus postage. If you didn’t, it’s £5.99 and serve you right! Email submit@bugged.org.uk and let us know how many you want, where to send them, and whether you want to pay by PayPal or cheque. Once we’ve run out of special edition copies, buy the standard version (lighter in weight, but still lovely) at the same price from CompletelyNovel or Amazon – ignore the ‘out of stock’ warning, which appears because it’s a print-on-demand book. If you order from these sources, you’ll be waiting longer for your book – about a fortnight… but it’s still a gem! Now then…. Birmingham, are you ready for us? Here it is…. a bouncing baby book! And at last we can say…. our book launches this week. Click HERE or click on the ‘Book launches’ tab above to see our invite, with full details of both Manchester and Birmingham launches. Places are FREE but it will really help us if you can book – phone numbers and online details are included. Please send details to anyone you want to invite – either by sending them to the launch page, or sending this Bugged launch invitation. For those of you watching in black and white – the Bugged project was one day of universal eavesdropping across the UK on July 1st, followed by six frenzied weeks of writing and submissions. Then the writers sat back, and the editors had six frenzied weeks of editing and working with the designer/publisher on the book. It looks lovely and we’re really proud. Several of you are trying to buy it already, bless your hearts. It’s not on sale yet because we haven’t launched it yet, see? The best place to buy the book is at one of the launches because a) you’ll get a special edition – slightly chunkier than the standard b) you won’t have to pay postage and c) you can get it straight away. If you can’t get to Manchester or Birmingham, you’ll soon be able to buy it online. And if you submitted to Bugged – whether you are in the book or not – you get £1 off. We’ll be sending out a discount code in the next few days – email us at submit@bugged.org.uk if you haven’t received yours by Wednesday. Ladies, gentlemen and people of more dubious upbringing – ta-dah! Behold, our book cover. On the outside, the names of our ten commissioned writers/editors. Inside, 44 others – and if you are one of the 300 who fell by the wayside, we hope at least that you might find your overhearing on the cover. Well done to all of you, and especially to those writers who do appear in the book: Helen Addy, Sara-Jane Arbury, Andrew Bailey, Mollie Baxter, Julie Boden, Ruskin Brown, Cathy Bryant, Dorothy Burgess, Helen Calcutt, Marilyn Donovan, Lucy Douglas, Jude d’Souza, Ian Duhig, Jo Field, Marilyn Francis, Sarah Gallagher, Roz Goddard, Susannah Hart, Angi Holden, Andy Jackson, Sarah James, Lucy Jeynes, Charlie Jordan, Calum Kerr, Emma Lannie, Pippa Little, Liz Loxley, Rob A Mackenzie, James Mason, Lynsey May, Emma Morgan, Ray Morgan, Benjamin Morris, Lynda Nash, Samantha Newbury, Kate Noakes, Alicia Ogg, Valerie O’Riordan, Emma Purshouse, Jacqui Rowe, Rosie Sandler, Sandra Tappenden, Val Thompson, Susie Wild and Philip Williams. These names include published writers, regional laureates, award-winning bloggers and some entirely new faces. All were included solely on merit, and by joint decision of the two editors. Whether you’re in it or not, take a moment to add yourself to our map. 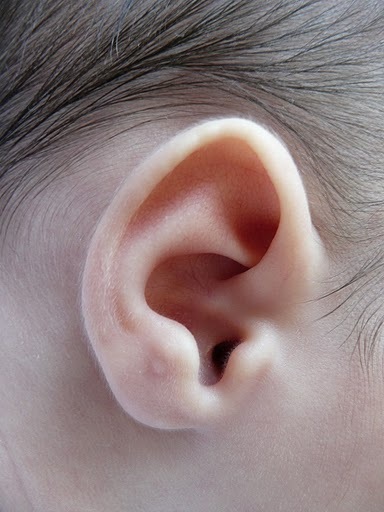 If you have a Google account (or five minutes to create one) then log in, go here to see our lovely map dotted with little bugs, and add a placemark of your own to tell us where you did your overhearing. It’s lovely to see all the dots building up, and gives a real sense of us as a nation of eavesdroppers, snooping across the whole of the UK. This week work from Emma Lee, Tamara Cohen and Janet Smith has been showcased. Meanwhile we’re delighted to hear that Susie Wild, who has a small-but-perfectly-formed-poem in our book, has also launched her collection of short stories The Art of Contraception. 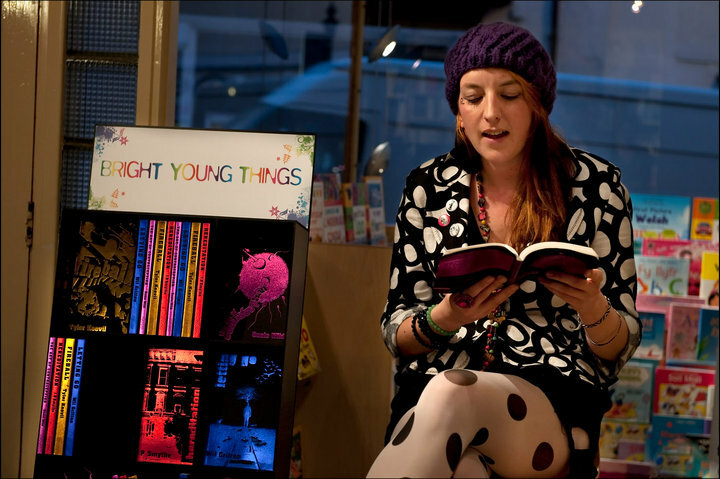 She and her publisher Bright Young Things have kindly agreed to let us have a copy for one of you to win. This one is only available for those of you who are NOT in the Bugged book – so here’s your mission… your life story in six words please. Attach it to this blog as a comment, or to our Facebook page – hell, you can even fit it in a Tweet to @BuggedProject – and get it to us before Sunday to win a copy of Susie’s book. Here at Bugged Towers our software is playing up, so we can’t post any more writings just now – but will do soon. Meanwhile, a warm welcome to the right ear of William, a new friend of Bugged, who arrived a few weeks ago and just had his hearing test. He’s fit for eavesdropping and ready to go. Our own gestation process is going well. We are just under a month away from delivery of a bouncing baby book. Print-on-demand (POD) publishers CompletelyNovel are acting as midwife. For us it’s an experiment – can new technology get a good book into print quickly, cheaply and well, to support writers and give them a worthy new outlet? POD is sometimes associated with vanity publishing – but we think it has lots of potential to do more. With professional editing and design, can it offer a worthwhile platform for new writing? It’s certainly fast and cheap – the book will be out whilst our July eavesdropping is fresh in the memory, so the bright shiny seeds you planted in summer will be in your mum’s Christmas stocking. No new writings for you today, as we are up against our own deadlines – but once again, one of our Bugged writers has come up with a prize worth having. Our Bugged book will include a short story by Roz Goddard but she’s better known as a poet, a former Laureate for Birmingham and the instigator of many fine projects. 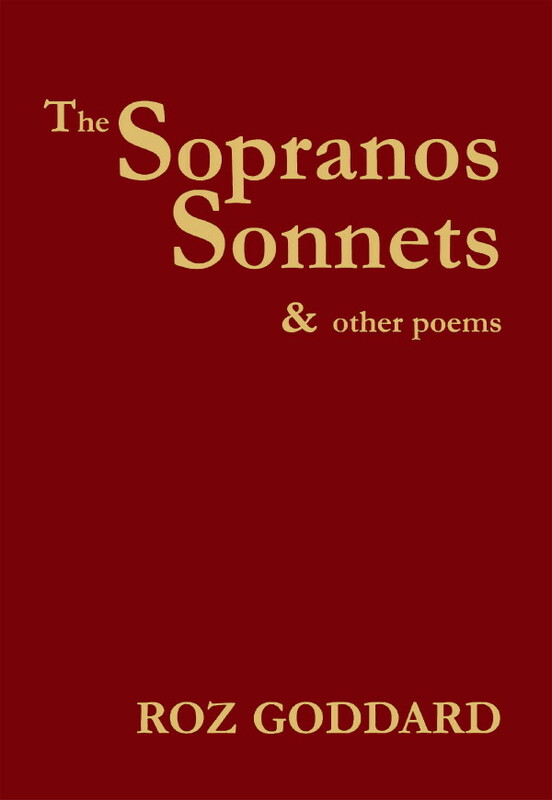 Her latest publication is a sumptuous pamphlet from Nine Arches press called The Soprano Sonnets. The poems respond to The Sopranos TV series, but we can vouch for the fact that they make perfect sense without any knowledge of it. 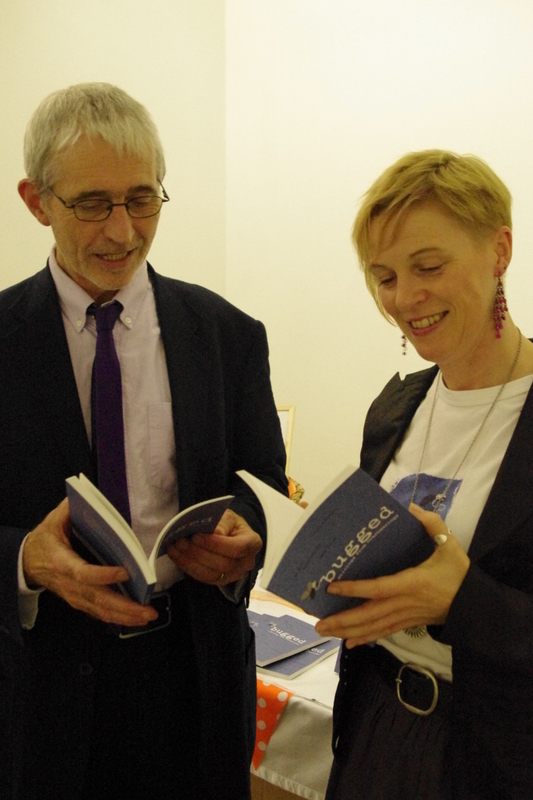 Roz is kindly giving away a special-edition version of the pamphlet, signed and numbered. Here’s how to win it: inspired by Tony Blair’s recent autobiographical shenanigans, Roz asks you to write a couple of lines on the theme of ‘Cancellation’. Send’em in to us, as comments here on the blog or as Facebook comments, and we’ll pick a lucky winner on Sunday. Elizabeth Gaskell. 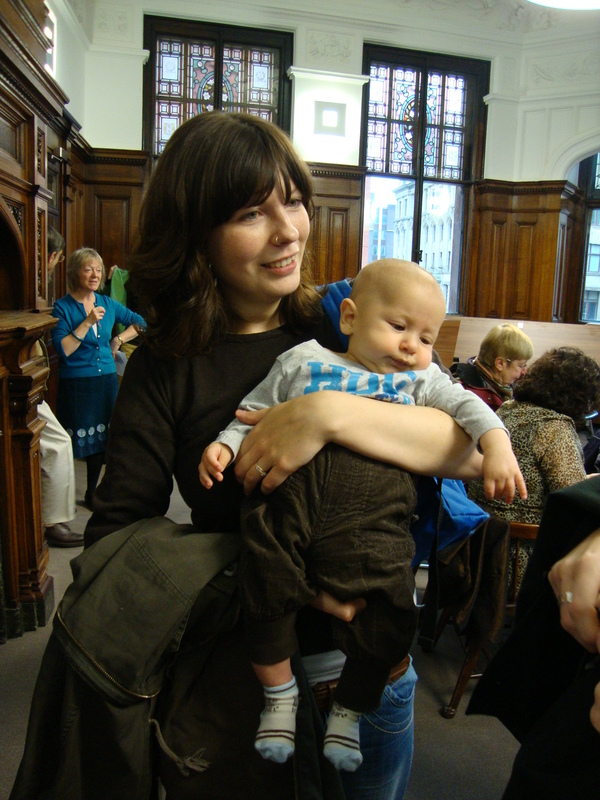 We’ll also be presenting some unique MLF commissions including the inaugural Manchester Sermon to be delivered by Jeanette Winterston at Manchester Cathedral, showcasing some of the UK’s hottest new talent, and inspiring the next generation of readers and writers with a tempting selection of family-friendly activities. Events take place in a wide range of prestigious and unusual venues across the city.